Space is the Worst: Empty, black, airless, awash in radiation, and dotted with immense clods of flaming plasma that make everything within millions of miles too hot to support life. If your living room were like space, you'd never, ever go there. 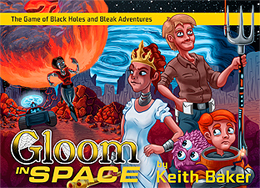 You win Gloom in space when your characters suffer the greatest possible tragedies before succumbing to the bleak but fitting respite of death. Unique transparent cards stack on top of each other to make scoring easy. The points you can see are the points in play - it's that simple! Compatible with Gloom and all its expansions.